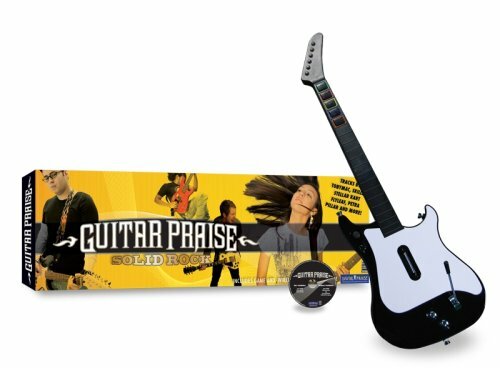 The guitar music game Guitar Praise cranks up the concert content with more than 50 tracks total including music artists Skillet, Jennifer Knapp, Newsboys, Petra, Casting Crowns, Reliant K, Pillar, 12 Stones, tobyMac and Stellar Kart. Song sets expand as players progress through this active, music experience. The four difficulty levels (based on five colored buttons on the guitar controller) range from easy to expert, challenging gaming guitarists to unlock more songs and guitar types while boosting their scores. Essential profiles help players gain ground quicker as well as keep bragging rights in the statistic department. The record keeping on each track boosts the replay value to a very high level. The reaction time on the guitar controller is decent. The wireless controller (included with the game) favors early reaction time on the fret buttons. The guitar controller has the standard strum bar and a whammy bar plus volume control buttons right at the player’s fingertips. Other game guitar controllers won’t work on this game, so players will need to invest in a second controller for the strong two-player game modes. Players can complement each other by playing bass and lead guitar, or both play lead guitar in two-player mode. Players can also tilt their guitar up sharply to get more bonuses or “razzle” their opponent in power dual mode. Special bonuses and multipliers increase the points quickly as high talent points tallies yield new onscreen guitars with richer sounds and different effects. The colors, borders and font are distinct enough to avoid any confusion or frustration during gameplay. The gameplay screens are pretty self-explanatory. Hold the note on colored streamed, then make a well timed release for high points. Hitting the right combination when the colored cues are spinning yield bonuses. Lyrics appear on the right on one-player mode then move to the center in two-player mode. Lyrics can also be turned off in the options if they get too distracting. Developers need to boost the audio quality in the likely future expansion packs. Setup challenges are partially alleviated by widescreen options (if you have this option on your monitor) for players who don’t have a projection/laptop related setup for viewing. A strong all ages game highly recommended (*** out of four stars) with endless hours of challenge and free flowing fun. Expansion packs also available. This entry was posted in Video Game Reviews and tagged guitar, Guitar Praise, Michael Siebenaler, Mike Siebenaler, Tall Writer, video games. Bookmark the permalink.